The eruption was first seen on May 31st 2011, by French amateur Amédée Riou who noticed a previously absent 14th-magnitude star in a image of the M51 galaxy. He had compared the new image to a previous one take and decided that it had to be a supernova because of its blue color and the fact that it was missing in previous images. 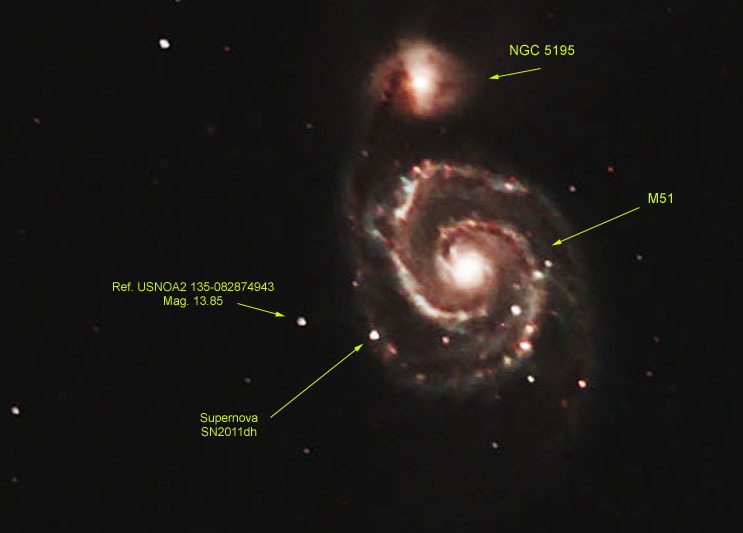 Shortly there after, others had also spotted the supernova among them the robotic Palomar Transient Factory and the Galaxy Zoo's supernova hunters. Measurements take of the hydrogen gas ejected from SN2011dh indicates that its traveling at astonishing speed of 17,600km per second. I am attempting to monitor and calculate its magnitude (dimness) over time. As you can see by the graph below, from the time I started to monitor it on June 4th 2011 it had increased in brightness 'till June 7th when it started do decline in intensity a bit. Please note that the smaller the magnitude number the brighter the object is.